Before I get to the 7 mistakes (and how to fix them) let me explain why having a good LinkedIn profile is important and why more than 1 million people are joining the service every 2 weeks. Not only is LinkedIn a great way to network, it’s also increasingly used by recruiters to post vacancies and, more importantly, to search for passive candidates. (“Passive candidates” is recruiter-speak for a person not actively looking for a job). 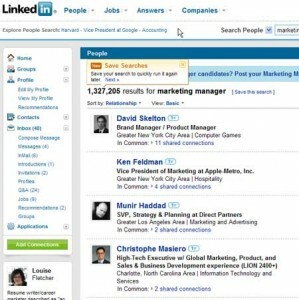 Indeed, LinkedIn now markets a service for recruiters that allows them to search profiles, store results and contact candidates, all from within an interface that they pay to access. But even recruiters who don’t pay for access, use the system to research candidates. And the best thing about LinkedIn? It’s free! If you do have a profile, you might think you’re set, but most of of you are not. Most of you are making simple mistakes on your profile that are negatively impacting your search. So if you have a profile already, use these tips to make it better. if you don’t, use them as a guide to create your first profile. Many people just list their one or two most recent positions, but this is a mistake because recruiters will often search for people who have worked at a particular company in the past. If you don’t include that company in your career history, they won’t find you. Likewise, LinkedIn allows people to search for former colleagues (which it does by looking for employer names). If you don’t list all your employers, you’re missing the chance to reconnect with a lot of people. Key point: Linkedin’s search rankings depend in part on the number of contacts you have – don’t limit yourself by not making every contact possible (I’ll say more about this a little later). So my first tip is this: List every position you have held. Also, be sure to list all associations and certifications because recruiters may choose to search by these rather than by employer. 1. Recruiters want to know what you’ve done and this is where you can describe your successes and accomplishments. 2. The descriptions will naturally contain keywords used by recruiters when searching and therefore may help you to be found. Tip: Write something about each role you held and focus not on boring descriptions of responsibilities but on actions, impact and results. See my profile for examples of this. LinkedIn Mistake #3. Not writing a powerful summary section. It’s crucial to write a powerful summary section. That’s because this section of the profile allows you to tell your story in 2,000 words and is the first thing people will see when they come to your profile. It’s also an important place to add keywords to help recruiters find you when they’re looking for someone with your skill set. Tip: It’s a good idea to go through job postings looking for commonly used keywords as these are often the words recruiters will use to search too. When you enter your current job title, LinkedIn automatically places it right underneath your name on your profile. So mine would read “Louise Fletcher, President of Blue Sky Resumes” if I hadn’t edited it. Don’t leave this headline as is! Not unless your job title itself is so impressive that people would want to hire you just because of it. (For example, if you’re a joke writer for The Daily Show, that might be all you need to say!) But for the rest of us, our job title isn’t the most compelling thing about us. See how the sub-header is right there. So you can either tell recruiters your current job title, or tell them something that will communicate your value. I recommend the latter. Here’s more on how to write a powerful LinkedIn headline. The image I posted above shows my search results when logged in to LinkedIn. Notice the little numbers next to each name? That’s how closely connected I am to them. LinkedIn serves up the people who are immediately connected to me first, and then goes on to 2nd degree connections – those people who know someone that I know, and then third-degree connections and so on and so on. This means that the more connections you have, the more likely it is that recruiters will find you. There’s long been a debate about whether you should only connect with people you know and can personally vouch for (this is what the company recommends) or whether you should be what is called an ‘open networker’ and connect with anyone who asks. I’ll probably write more about this at some other time and it mostly depends on your goals for LinkedIn and your own personal philosophy, but if you want to be found in the maximum number of searches, there’s no debate. Open networking is the way to go. Tip: If your goal is maximum visibility, run a LinkedIn search on the word “LION.” This is short for “Linkedin Open Networker” which means that they are open to contacts with strangers. Connecting with them can increase your visibility enormously because they all have many contacts of their own. If you decide that open networking is not for you, and that you really do want to limit your connections to people you know, then at least make sure to add as many of them as possible using the various features LinkedIn makes available. When you create a profile, LinkedIn will automatically assign you a profile URL that people can use to access your profile directly. It will usually contain numbers and letters. But you can change this URL so that it contains your name (mine is www.linkedin.com/in/louisefletcher). This is important not so much for internal LinkedIn results, but for external Internet searches. When a recruiter or potential client researches you, you want them to find compelling and positive information. LinkedIn has enormous weight with the search engines, and so your profile is one of the best ways to ensure you make page 1 of Google for your name. (If you need proof of this, just google my name. I share a name with a famous actress (yes, she played Nurse Ratchett in One Flew Over the Cuckoo’s Nest and yes I’ve heard all the jokes!) so you would expect that I wouldn’t make page 1 of Google, and yet, at the time of writing, my LinkedIn profile was #7 – that’s the highest result I have despite having a blog, a website, a Twitter profile and writing numerous articles on high traffic web sites). Just the other day I was reviewing a client’s online presence and found a LinkedIn profile with almost no information. “That’s impossible,” he told me, “I filled the whole thing out.” After a little back and forth, we figured out that he had set his profile not to display most information on the Internet. Remember that not all recruiters or clients will be viewing your profile after logging in to LinkedIn. Many will come to it via a Google search. If you set most of your profile to private, it won’t be very impressive. Tip: To change this, click on the ‘edit profile’ tab and look for ‘Public Profile.’ Click the small ‘edit’ next to the URL and you will arrive at the page where you can choose what to make public. Unless you have a strong reason not to do this, I recommend sharing everything. LinkedIn is increasingly becoming an essential tool for professional and executive-level job seekers. Not only do they advertise vacancies and provide the opportunity to research and network with people in your target companies, but they are increasingly marketing their database to recruiters and this gives you an excellent opportunity to raise your profile and get in front of the right people. So if you had made any of the mistakes listed above, don’t waste any time in fixing them. (Oh and if you know of more tips and strategies, please feel free to add them in the comments). PS: If you’re ready to really get the most out of LinkedIn, check out The Blue Sky Guide to LinkedIn. This downloadable e-book takes you step-by-step through the site, with detailed instructions and screenshots on everything from setting up an effective profile through making connections all the way to understanding the many additional benefits the site has to offer. Once you learn how to use LinkedIn properly, you’ll never leave. 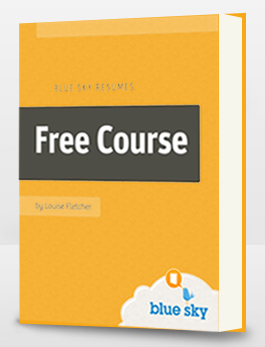 Our free e-course will teach you 7 easy steps to getting hired via the world’s number one recruitment website. Make these painless changes and the opportunities will start coming. The information is delivered by email and the first lesson will arrive as soon as you sign up. (Rest assured that we won’t send spam and we’ll never share your email address). Hi Louise! Terrific post! You make excellent points that can help folks get the most out of LinkedIn. I’d only add “personal branding,” and what I mean by that is to write a differentiating summary that reflects skills and attributes that help you stand out from others who do what you do! GREAT info, as per the norm from you. Although, I can think of one more mistake people make. You pointed it out in your Dec 23rd post: “Don’t make this simple error on LinkedIn” — Dont’ add certifications and initials after your name. The search engines will never find you. Spot on advice all around. THANKS!! Good points guys – maybe I should have made it 9 points! Some summaries are really weak and that’s a shame because it’s the one place LinkedIn allows you some flexibility. Other than that great stuff! Alec, that’s a great point. I also like to include the URL on resumes and cover letters. Even if no one clicks on it, it says a lot about you. Especially for older job seekers, who employers might think are not tech-savvy. Louise, outstanding post that I learned about through LinkedIn updates just now. I especially like your point about including LinkedIn URL on resumes and cover letters. 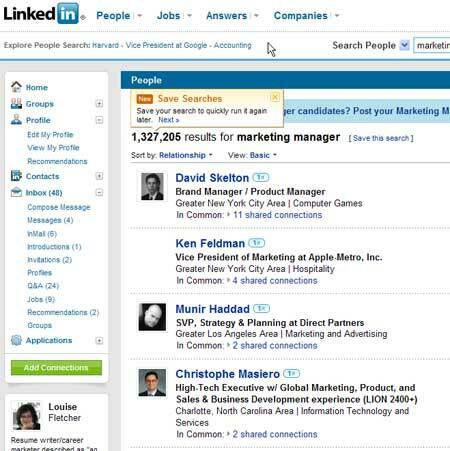 Just yesterday, I was working with a 30-something IT client — they’d not heard of LinkedIn. I’m sending them a link to your post. Thank you! Louise, good points. Another valuable thing people can do is add the slideshare application to their LinkedIn page – it allows you to post not only powerpoint slides, but also pdfs of articles, etc. Its a great way to showcase your work product (have to make sure you have the rights to post the content of course!). So far not many people seem to be using it, I think they are missing an opportunity. I’d be interested in your thoughts on slideshare. Billie, it’s amazing that someone so young hadn’t heard of it! I use the WordPress application to have my blog included in my profile and that’s another good option for those who write a professional blog. I’m glad someone mentioned showcasing your work. I just discovered how to add video to my Linkedin profile (I work for an internet video marketing company). I’m sure they’ll make it easier in the future, but right now you have to use YouTube, Google Docs, and their new Google Presentations App. Hi Louise – fantastic and useful post (actually forwarded to me by a fan of yours – Mike Bevis). One more suggestion I would make is Listing other roles you have in your life as “positions” For example, I’ve published a book – so I’ve listed “Author” I’m also a blogger, and participant in a variety of organizations – I list those when it’s appropriate. It does require a little finesse with the fields – but I’ve found it to be really useful in giving people a full picture of who I am professionally. Ivana, what a great idea! I’m putting together more tips and will be sure to include yours (with a credit of course). Will, I missed your comment earlier. Sorry. The value a job seeker can gain from connecting with people they don’t know is search visibility. Even if they do nothing with the connections. When you search, you see people who are closely connected to you first. The more people you know, the more likely you will show up as a second-degree connection. I’m not advocating for it – I think it’s a personal choice. But I thought it was worth pointing out. Merra Lee, I tried to comment on your post but (a) you need to log in and I didn’t have time to create an account (b) when you click on that link it doesn’t work. I would say that Twitter and Facebook are every bit as valuable as LinkedIn. I use all 3 and with a very clear business goal in mind. Each allows you to connect with a different group of people and all have brought me clients. Like anything though, it’s all about the time you put in and knowing what your goal is. Thanks for a helpful article! I consider myself fairly LinkedIn savvy, and still learned a few things — which I quickly implemented! Excellent point of view Here! Thanks for the information. sounds so great and helpful. Kudos!